It’s our members who make sure that the Equity Partnership represents the views and needs of all Lesbian, Gay, Bisexual & Trans communities in Bradford. By becoming a member you can help us in our work to promote and develop our LGB&T communities. Individual membership – For LBG&T individuals. You can vote at general meetings, stand for election to the Board of Trustees and be co-opted onto the Board. 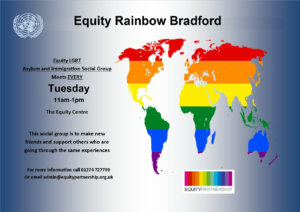 Group membership- For LGB&T groups or organisations in Bradford and the district. Groups can vote at general meetings and propose candidates for election to the Board of Trustees. Associate supporter – Open to all non-LGB&T individuals, groups, organisations or businesses who work with LGB&T people. Membership is free for individuals. Groups and associate supporters pay on a sliding scale from £10 to £50 a year according to their income. You can join us right now by filling in our membership form. We are always keen to have volunteer help with our many activities and events, including being a Trustee on our Board. If you think you have skills which would be useful for Equity Partnership, would like to learn new skills or become a Trustee please click here.